Right now, in September 2018, construction costs are high in metro Atlanta because of high demand. So if you plan to replace your roof in 2019 you may pay more for it than you would in a year when demand for construction services is lower — market principles prevail. While the pricing climate shouldn’t prevent you from getting a new roof if you need one, postponing roof replacement by doing an exemplary job with maintenance and strategic repairs might save you money in the long run. It costs more to build right now because Atlanta is booming. Metro Atlanta’s population growth last year was the second highest in over a decade and Atlanta is currently the 10th fastest growing metro area in the nation. The city’s population has grown by more than 15% since 2010. All of the tens of thousands of people who’ve moved here need places to live, shop and work, and companies need to provide the facilities that attract and accommodate them. Universities and assisted living centers are booming as well — both of these sectors are strong. How long will the growth trend continue? There’s no telling, really. Long-term projections show a continually rising population (especially for Gwinnett and Fulton counties) but there will certainly be dips in the trend line and construction demand will slow and prices will drop. Atlanta was hit by the last recession later and harder than the rest of the country, and our recession lasted longer because we were overbuilt. But if you adopt a strategy to wait until a recession to re-roof your property, the recession will probably create other budget considerations you’ll need to deal with and it might not be the best time for a major investment. If you have a commercial roof, tax planning for 2019 as it relates to your budget process is different than it was in 2018. The new tax law adds commercial roofs to section 179 property and doubles the deduction to $1 million. The new law also reduces the commercial roof depreciation schedule from 39 years to 25 years (which is much more realistic). This means you can now choose to expense up to $1 million for roofing improvements in a single year or spread the deduction over 25 years. If you need a new roof when construction demand is booming, the one-time deduction could help you pay for it but it’s important to work through the numbers and compare your options with your tax expert. Our post “4 Ways the New Tax Law Can Benefit Commercial Roof Owners” with Robert L. Brown, CPA, has additional details on the implications of this new law. As long as your current roof is in repairable condition, the repair work can stop any further damage, and your roofing contractor is highly skilled at roof management, postponing your re-roofing project might be a good idea. It could buy some time for prices to level off and you could still come out ahead despite the cost of extra repairs and maintenance. Consider asking your contractor for two proposals — one to replace your roof and one to make the kind of repairs and inspections needed to carry you for another few years. Then run the numbers with your CPA to look at both options from a tax perspective, too. Maintenance is equally important if you want to postpone re-roofing. Usually, when a roof fails early it’s because people have made mistakes. Often the people who are responsible for the roof weren’t diligent about inspections, maintenance, and repairs, or people who are not responsible for the roof — like tenants, technicians servicing rooftop equipment, and other contractors — damage the roof unintentionally. 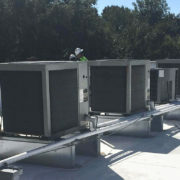 Part of extra-diligent maintenance for 2019 would include ramping up inspections, keeping rooftop activity to a minimum, adding walk pads and other protective measures, and making sure your roofing contractor is present whenever any work is done on the roof or related to the roof (including any roof penetrations). Why is one commercial roofing contractor cheaper than another? Read our analysis. Choosing to budget more for maintenance and repair rather than replace the roof can make sense. If your roof is aging or has several areas that may be failing soon, don’t postpone re-roofing. It’s not worth it. A roof that’s leaking because it’s old needs to be replaced. Even if you repair one area you’ll soon end up with the same problem or worse in other areas and that could lead to disaster. Neither repairing a failing roof or allowing an old roof to fail is a good investment. Postponing replacing a roof on a high-rise or a roof that’s otherwise difficult to access probably isn’t worth the wait either. Those re-roofing projects are always at a premium so you won’t likely see any pricing differences once construction demand slows down. Also, if you have tenants who are expecting a new roof or have to deal with frequent roof leaks and repairs, it’s probably best to replace the roof now instead of risking the loss of your tenant. You also don’t want any legal exposure from mold or mildew issues that could be related to roof leaks. Another option for 2019 might be installing a new roofing system over your existing roofing system. Recovering (or restoring) your existing roof can be a viable re-roofing choice that gives you 10 or more years of longevity — provided you don’t already have two roofing systems in place. Three roofs is a bad idea and against code. Have your roofing contractor or roof consultant conduct a thorough analysis to see if recovering your current roof is feasible. This process will probably include making inspection openings so they can physically examine all of the layers of your roof. In addition to determining how many systems you currently have, they’ll look for moisture infiltration (trapping moisture underneath a new system causes the insulation to deteriorate and can lead to expensive mold problems), any problems with the roof decking or issues with the roof membrane. They also should conduct uplift pull tests. If your roof is a good candidate, you will essentially get the benefits of a new roof without the costs associated with tear-off and disposal. And you will probably improve your roof’s thermal performance and save some energy, too. If you have an established relationship with a reputable roofing contractor you’ve had conversations every year (hopefully) that cover these kinds of budget topics. A three-year capital budget and an update on the life expectancy of your current roof should be part of your annual maintenance contract. No matter how good your contractor is, they won’t be able to predict how much a new roof will cost you in 2020 or 2025 or in any year beyond the next one. So they won’t be able to provide firm numbers on how much you can save if you choose to focus on maintenance and repairs in 2019. But they can (and should) provide you data and advice that allows you to make informed roof management decisions based on the condition of your roof, your goals for the property and your budget strategy. At Sentry, we believe the quality of our advice is one of the things that sets us apart. We want to help you make good decisions that meet your needs. If in 2019 one of your needs is to not pay high construction prices for a new roof if you can avoid it, I invite you to reach out to us. We’ll gladly discuss your options with you.